Hashtag Activism Day is only three days away. Sorry, I meant Virtue Signalling Day. You know the date, January 26th, when the long line of bleeding hearts awaken from their slumber and type their righteous indignation about Australia’s national holiday. It is like the day presents an annual epiphany to these people that Indigenous Australians exist, because most of them are silent about them for 364 other days of the year. With the exception of a small minority, you would be hard pressed to find the #changethedate hashtag heroes taking any time or notice to address the very real issues that impact Australia’s first people on a daily basis. Things like education, healthcare, employment, domestic violence. While it might be true that such problems indeed had their starting point long ago in 1788, it’s also true that a hashtag and a share is not going to do anything to fix it. This is why the ‘invasion day’ crowd are the shallowest type of people. Truth is, they care more about themselves and their own virtuous image than they do about Indigenous Australians. They are more interested in projecting their fake white guilt than they are about addressing problems that require complex and often uncomfortable policy solutions. They are the shallowest type of people because their guilt and grandstanding is fake to the core. It does not even occur to them that the very act of typing on their smartphone or laptop about their regret and guilt over European settlement is an exercise in rank hypocrisy. On the one hand they are ‘sorry’ the Europeans arrived and they share the offense that Australia would dare to commemorate the date that marked the beginning of its modern development, yet on the other hand they are happy to enjoy the benefits that come from western culture. They are the shallowest type of people because their regret and sorrow is a lie. Truth is, deep down, no matter how much they deny it, they are happy about it, they are happy the British arrived here. While they keep tapping away at their shiny phones, lecturing everyone else about how racist and culturally insensitive it is to feel good on January 26th, they are hypocrites enjoying the fruits of modern Australia. If they were true to their word, if they really did feel regret over British invasion, they would abandon the very laws and codes it embodies. They would spend time in Indigenous communities. They would actively immerse themselves in cultures and languages in an effort to understand them. This rarely happens though. After the hashtag, life goes on as normal. Too much Netflix to watch. I’m happy the British came to Australia because I live in a first world nation. I’m happy the British came to Australia because western culture allows me access to this technology. I don’t really care about real Indigenous issues, but this seems to be an issue easy for everyone to grasp so I’m going to share this meme because it will tell all of my followers that I am virtuous. I’m going to spend Australia Day drinking or reading or watching television or hanging out with friends, because I’m too caught up in my own life to help the people I supposedly care about. This is what is really hidden beneath their words. To be fair, however, the one argument that might hold weight is the idea that if the date causes offense to any group, it is easy to change it out of respect. So let’s pretend that they are not simply grandstanding for a moment and assess the merit of such a position. January 1st – Federation Day. The day the constitution of Australia became entrenched in our nation’s fabric. That same constitution failed to recognise Indigenous Australians as people and denied them the vote. May 8th – This one is ridiculous, but it often lightheartedly comes up due to the ‘maaaate’ association. ‘Mate’ is an Australian colloquialism that has its essence from our European heritage, the same heritage responsible for the destruction of indigenous languages. So no go there. February 13th – This is the date that Kevin Rudd apologised to the Stolen Generation. The national apology still polarises public opinion and it is worth asking whether a day that commemorates a national apology for a country’s past wrongs is really appropriate for celebrating a nation. Such is the ignorance of many of these people that the day is already ‘National Apology Day’ on the calendar. March 20th – The day Canberra became our national capital. Seems okay, but then what about the troubled history with the Aboriginal Tent Embassy there? Nope. This is where group identity politics leads. No date can ever be satisfactory to everyone because there can always be a cause for grievance for whatever category you choose to divide Australians into. Aboriginals, women, white males, LBGTQI people, Muslims, Asians, tall people, small people, large people, depressed people, elderly people, people with freckles. Look for it, and a grievance could be found. God forbid the essence of a human be their individual character rather than whatever sub-group they might belong to by default. 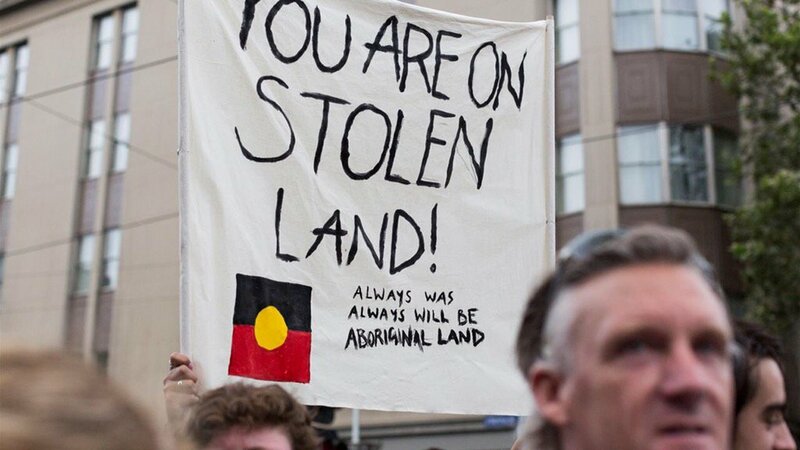 I’ve already alluded to it, but what is also astounding about the invasion day crowd is their complete silence on the days that actually acknowledge and commemorate indigenous Australians. They are oddly absent on these days, probably working or socialising or doing any number of things that western civilization has given them the opportunity to do. 13th of February – National Apology Day. I don’t expect to hear much from the same people on any of these days because I never really have. It’s probably because they don’t know they exist, or they are on holiday, taking Instagram shots of other conquered territories around the world (wonder if they know). So, the countdown is on. January 26th is fast approaching, and they are gearing up with their hashtags and shares and statuses to fight the good fight and change the world. Sit back, drink a beer, and enjoy the show, because it’s Australia’s annual drama charade, when the actors and pretenders try to one up each other to draw the most virtue points from the adoring crowd. I can’t say I agree with this since by your response I’m classified as one of those ‘shallow’ hypocrites. I’d say there is quite a bit of generalisation that you may want to look out for. I’m all for a change of date. Sure, I may not talk about it every single day, but I talk about it when it counts and you could ask me the same question on any other day of the year, my answer would be the same. It’s insensitive to the original owners of our countries and if it’s a ‘celebration’ of Australia, then their feelings and their past need to be taken into consideration the most. Iamhappy the first 1788 fleet arrived safely with decent captain arthur phillip,most likely everybofy aboad was glad to arrivesafely,am pssrticularly gladyhere be dome anglo jewish and anglo romani people among yhem eho to mearevitsl,vibrantstrands in the austrslian modsic oflife and whogenerallygot along well withoriginal ausyrs lian inhabitants. What about a “Lucky to be alive Day”unlike the Soldiers whom died defending this Country, if they had of failed Invasion Day may of had some meaning along with total Genocide Day.I support Survivor day regardless of ones color or Culture, and Work day to keep our Country solvent to insure a future for future Generations. The main reason as I see it, is because there are 364 other reasons for a Hate Australia march.